The Groningen area of Holland – just about 220 miles distant from the UK in a straight line or a similar distance as from Preston to London – is not the first place you think of when considering earthquakes. Now think again…. The setbacks continued as last week saw a massive thumbs down for fracking right across the country start here in the Fylde. 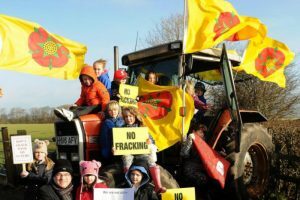 On January 18th Fylde Borough Councillors followed the MP’s lead and voted unanimously to reject Cuadrilla’s latest proposals, sending a clear and unequivocal message to both the company and to Lancashire County Council. Then last Wednesday – 24th – Lancashire County Council’s Planning Committee followed the advice of their Planning Officer in agreeing that to allow Cuadrilla’s HGV traffic onto the country lanes around the Roseacre Wood site would pose such a severe risk to road safety that it could not be countenanced under any circumstances and voted – again unanimously – to maintain their position, joining the other parties at the re-opened Public Inquiry objecting to Cuadrilla’s ‘Mitigation’ proposals. These successes alone would have given cause for celebration but the good news continued as Surrey County Council found that an application by Angus Energy to drill at its Brockham site was invalid and was thrown out. Then last Thursday 25th (will it become known as Thunderous Thursday?) the previously seeming unbreachable wall began to crumble as firstly Greg Clark, the Secretary of State for Business, Energy and Industrial Strategy who had been widely expected to give the green light to Third Energy, enabling them to begin fracking at Kirby Misperton in North Yorkshire, announced that he was delaying any decision until Third Energy had filed their overdue accounts for 2016 (as they are required to do by law). He further announced that he was adding 2 further financial checks for all fracking companies before giving the go-ahead. Surely this must give our Frack-Happy government a headache. Will they finally accept that WE SAID NO to fracking or does Theresa May really believe that she can ride roughshod across the country, overturning every local decision with impunity? Electrical Sustainability? Not By Fracking!! Shale gas ranks among the least sustainable sources of electricity, according to research from a team of Manchester scientists.